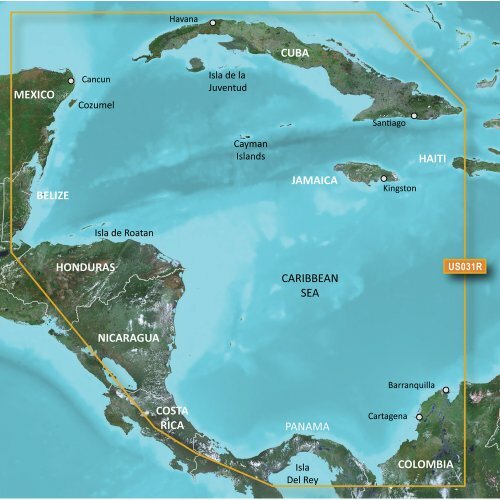 BlueChart g2 Vision - VUS031R - Southwest Caribbean - microSD/SDSee your vessel's precise, on-chart position in relation to navaids, coastal features and restricted areas with premium features found in this detailed marine mapping data. Includes all of the features of our BlueChart g2 product, plus 3-D perspective above and below the waterline, Auto Guidance, high-resolution imagery, and aerial photos of ports, harbors, marinas and landmarks.Coverage:Detailed coverage of the northern coast of Central America from Cancun, Mexico to Barranquilla, Colombia, including the Panama Canal in its entirety. General coverage of the northern half of the Gulf of Panama. Also includes detailed coverage of the coasts of Cuba, Jamaica, and the Caymans in their entirety.